Surrey’s Jas Dhillon says it’s a dream come true to suit up for the BC Lions. SURREY — Although the 2015 season was a self-described roller coaster for Jas Dhillon, he has no complaints about how everything worked out. The offensive lineman was drafted by the Toronto Argonauts in 2014, but was released prior to the beginning of the 2015 season. They offered him a spot on the practice roster for the second straight season, but Dhillon felt he was ready to take the next step. He went back to Surrey to be with his family and friends, where he spent three months training. “I treated it like another offseason,” said Dhillon. “It was the first summer I had to myself since I started playing football. After a three-month hiatus from football, Dhillon signed with his hometown BC Lions on Oct. 6, 2015. Dhillon is accustomed to playing football in the Lower Mainland. He started playing for the South Surrey Rams before spending a season at the University of Regina. He came back and played for the relocated Langley Rams before going to UBC on a scholarship in 2012. Not only is it a dream come true for Dhillon to suit up for his hometown team, but he is reunited with his family in Surrey. One can imagine that it would be a full-time job to feed an offensive lineman, but Dhillon says he does most of his own cooking. That kind of focus on detail is vital on the field as well. He realized this when he made the switch from the defensive line to the offensive line during his last season at UBC. “There are more responsibilities on the offensive line,” said Dhillon. Spending the 2014 season on the Argonauts’ practice roster was an eye-opener, he added. He has a chance to progress even further under the tutelage of offensive line coach Dan Dorazio, who has spent the last 14 years with the Lions. 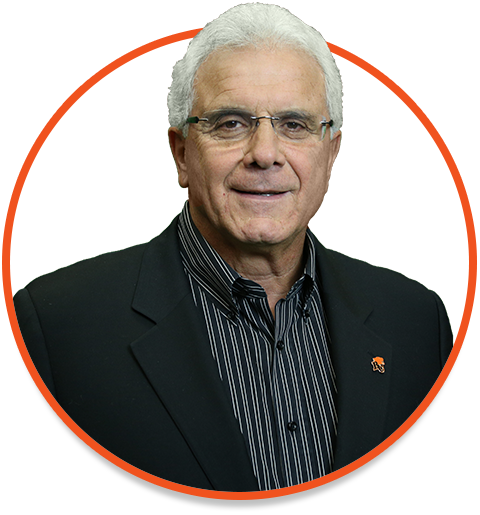 Dhillon said he is also excited to play for the “legendary” Wally Buono (pictured), back as head coach this season for the first time since he led the Lions to a Grey Cup championship in 2011. “When they announced that Wally was going to be the coach again, there was a buzz throughout the locker room like I’d never seen before,” said Dhillon. While Dhillon had to overcome a few obstacles before joining the Lions, perhaps there was none bigger than the one he faced as a kid – convincing his parents that he should play football. “It was a struggle for my family to allow me to play football, I had to kick and scream. My parents were super reluctant and I had to sneak out to a few practices. Dhillon is one of only two Sikh players to currently occupy a spot on a CFL roster. The other is Sukh Chung, who also played for the UBC Thunderbirds and now plays for the Winnipeg Blue Bombers. Although there are relatively few South Asians playing pro sports in North America, the number is steadily growing. Players such as former CFLer Nuvraj Bassi have paved the way for Dhillon and Chung. Other examples include Prab Rai and Jujhar Khaira, who earned opportunities to play in the NHL. In 2015, Sim Bhullar became the first South Asian athlete to play in the NBA and his brother Tanveer is on track to follow him. Dhillon is also part of a different trend – the increasing number of Lions’ offensive linemen from B.C. Dhillon’s workout partner Cody Husband hails from New Westminster and used to play for the UBC Thunderbirds. Also, newly-acquired centre Tim O’Neill is from Victoria. Dhillon’s journey in professional sports is just beginning. He still has to crack a formidable Lions offensive line, one which helped running back Andrew Harris total the second-most rushing yards in the league last season.